It is common in the fitness world to always go for the "tech-fix". Every question deserves a new machine or gadget. Every day a new theory that replaces the old one and a toy machine to go with it until the new theory itself is dethroned by a shinier one with a superior marketing strategy. It is my contention that we have had the answers all along and simply choose to ignore them; thinking that the " best answers" are by definition, expensive and complex. This could not be further from the truth. Your body, while being very complex in its structure and operations; is very simple in the way it reacts to simple problems, it adapts. Adaptation is what you are after. What you practice you will become better at over time. You will adapt to what you work at and become in any objective sense "better". That is why I'm posting this. People are buying very expensive machines to do what could be done much better without. If you are a weightlifter then by all means, lift. If your sport uses a particular implement then abosolutly you must plan what you are doing with that in mind. However, If you simply want to get healthier, stronger and have a better life in general then this is written for you. 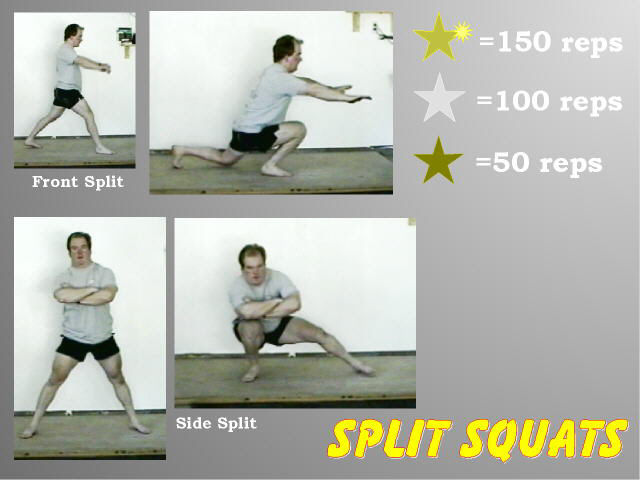 Choose one exercise from each group (A squat, a bridge, a pushup and a chinup) presented here and work on it till you reach the level you are after then go on to harder and more complex things in that group. In only a matter of weeks or months you will surprise yourself at what you are capable of doing and how much better you feel. If you want more exercises go to www.combatwrestling.com and take a look at the book "Combat Conditioning" by Matt Furey. I cannot say a bad thing about this book. Go all the way down on every rep, if you have trouble getting down there at first then keep trying. 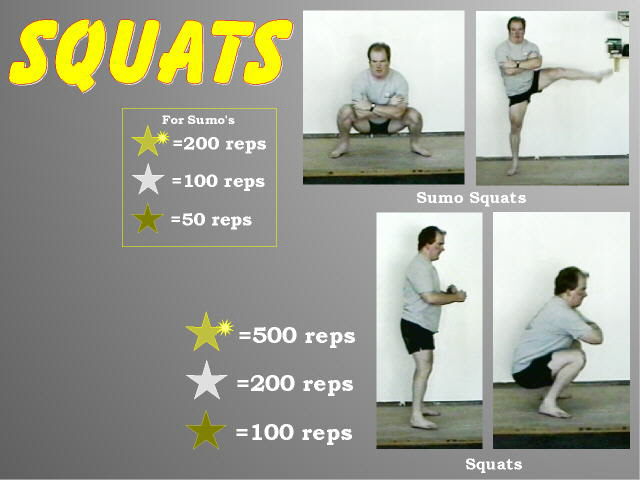 You can make these harder by doing them as jumps or doing them on your toes. This take a little practice with balance and flexibility, but not as much as the next thing. If you want to make these more advanced you can also do them as jumps, switching legs in flight. These take some time to master, but when you can do them you have really accomplished something. 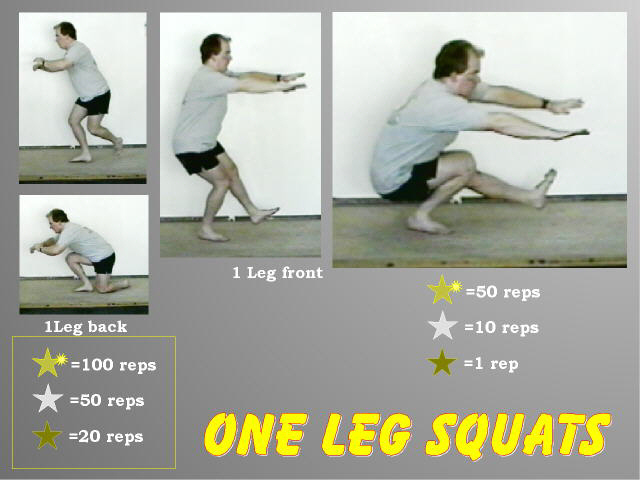 The back leg in the first is only barly touching to mark the bottom of the rep. In the second, touching is a no-no. These can also be done as jumps, if you are very adventurous! Looks impossible right? You'll probably be doing it after a few sessions like it is nothing. Nothing stretches and strengthens your entire spinal column all the way up your neck like this. I have also included the front bridge for some variety. The idea is to get your nose to touch the ground. If you can't at first just go as far as you can each session till -Presto-, you are there. For the more adventurous, you can try going for a walk, forward, backward, sideways and spinning in the handbridge positions. You can also try touching your chin instead of your nose to the ground. Here's a few to keep you busy. Always touch your chest or chin to the ground (except for the handstand). Don't cut things short. 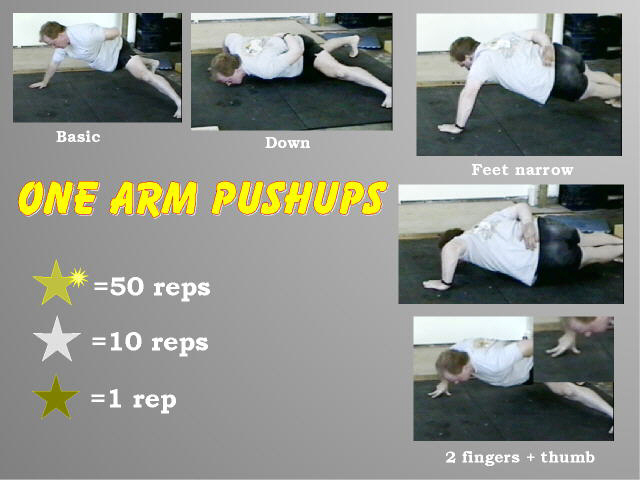 Start with the knee pushups if you must but after you can do about thirty five try the regular ones. You can change hand spacing and angles for variety. To make the regular pushups harder you can push them up fast enough to fly off the floor and clap in between. One clap is good. three claps is fantastic! You can also do these on your fingertips or the back of your wrists. 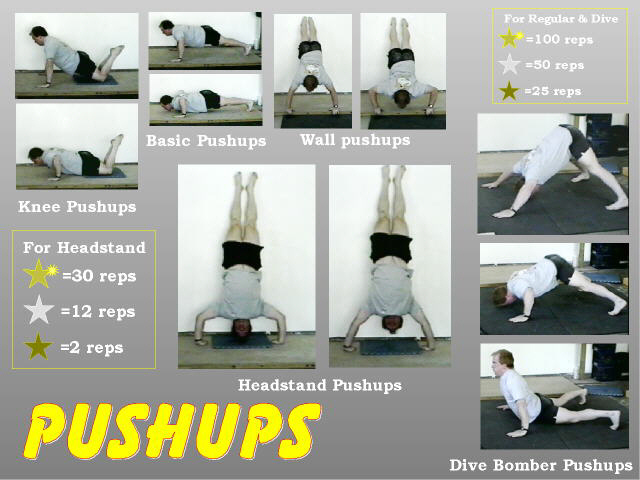 You can also do the handstand pushups unsupported, without the wall. That is really impressive. Who knows? Someday maybe you will do a one-armed-fingertip-handstand pushup. You can take this as far as you like! These are tough. 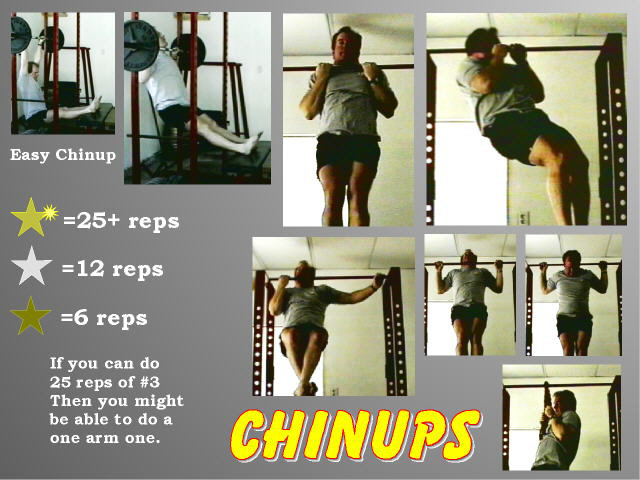 Once you can do these for a few reps, you have a pretty strong upper body, not to mention the severe abdominal work you get as a bonus doing these. To make them harder, you can put your feet up or do them hard and fast enough to get some air! You can also do them on your fingertips like in the picture. Ouch! You don't always need a bar to do these. A rope or towell over a tree branch or rail will do just fine. In fact anything you can grab onto that gets your feet off the ground will do the job. Always get your chin above the bar, don't settle for sloppy reps.
Once you can do 25 or more reps then take a shot at a one arm one. Thats impressive! The picture with one arm out further than the other will help you prepare. You can also add weight to yourself by hanging heavy stuff on a rope around you. Arrange things however you like, it is yours after all. As you get better at one thing them move to something more challenging or try to take your numbers from "Ok" to "real good" to "outrageous". In the beginning its perhaps good to just pick a squat, bridge, pushup or chinup that you can do and three to five days a week, just do a set and see if you can improve on your last performance. You'll be stunned how quickly things go up. If you can get to the point of getting gold stars in all of these then you are miles past the 99th percentile. You are dangerous!